The Toyota Camry is one of the most popular nameplates in the entire industry, so the vehicle doesn’t really need any introduction. However, even if you’re “in the know” when it comes to car news, you still may be shocked about how many amenities engineers crammed into the 2019 variation of the car. Below, we explored some of the most notable attributes of the 2019 Toyota Camry, providing you with some context before you begin your pursuit. Before long, you’re going to find that you want to start Googling “Toyota dealers near me” to initiate your car search. Whether you’re looking for an edge in power or an advantage in fuel efficiency, you’ll have the ability to choose an engine that best fits your needs. The 2019 Toyota Camry boasts a pair of impressive engine offerings, allowing customers to truly zero in on the performance specs that they’re seeking. The 2.5-liter Dynamic Force Four-Cylinder engine can ultimately crank out up to 206 horsepower and 186 pound-feet of torque, making it a plenty-powerful ride. Most impressive is the absolutely incredible fuel efficiency, as the engine can deliver up to 41 miles per gallon when traveling on the highway. When you consider the power and the fuel economy, you’ll understand why we’re touting the nameplate as one of the most versatile offerings in the entire class. Meanwhile, the 3.5-liter V6 engine is for those seeking the utmost power from their system. This offering is capable of delivering a mighty 301 horsepower and 267 pound-feet of torque, making it one of the most hulking options out there. The system has also proved to be relatively fuel efficient, delivering a 32-mile-per-gallon highway fuel economy. Of course, regardless of which engine you choose, you’ll appreciate an unmatched driving experience thanks to the nameplate’s mechanical inclusions. The brand’s McPherson strut front suspension leads to optimal handling, while the Direct Shift eight-speed automatic transmission improves overall stability. There’s even a three-mode drive switch (ECO, Normal, Sport), allowing drivers to adapt their vehicle’s mechanics to accommodate the impending road conditions. If you’re going to be relying on your new 2019 Toyota Camry as a commuter or family vehicle, you’ll appreciate all of the safety functions that the brand’s engineers included in the ride. The vehicle is built to withstand a whole lot of punishment, especially when a driver finds themselves in an accident. However, Toyota has also assured that drivers won’t often find themselves in those types of situations to begin with. Specifically, the Toyota Camry is jam-packed with features that should prevent accidents from happening in the first place. Inclusions like the Blind Spot Monitor (with Rear Cross-Traffic Alert) should prove to be invaluable when traveling in traffic, as the technology will serve as an extra set of eyes for the driver. Meanwhile, the Bird’s Eye View Camera allows drivers to monitor everything that’s happening around their new car, while the Intelligent Clearance Sonar (with Cross-Traffic Braking) will help guide drivers around the parking lot. Customers can also rely on the brand’s incredible Star Safety System, which includes a number of features that may initially go unnoticed. However, after some time behind the wheel, you’ll actually understand how essential these inclusions are. The six advanced safety features include Vehicle Stability Control, Traction Control, Anti-Lock Brake System, Electronic Brake-force Distribution, Brake Assist, and Smart Stop Technology. Toyota is focused on providing their customers one of the best possible driving experiences. One major way they’ve been able to succeed in this goal is via their interior technology and amenities. These various inclusions boost entertainment, comfort, and convenience. The big star of the interior is the eight-inch multimedia touchscreen, which provides quick and easy access to useful applications (via the Entune 3.0 App Suite). The unit is also compatible with Apple CarPlay and Android Auto, meaning drivers can make phone calls, send text messages, and listen to their favorite playlists without compromising safety. If you’re planning on jamming out to your favorite tunes, then consider opting for the incredible 800-watt Entune 3.0 Premium Audio system, which includes nine speakers and the exclusive JBL and Clari-Fi technologies. 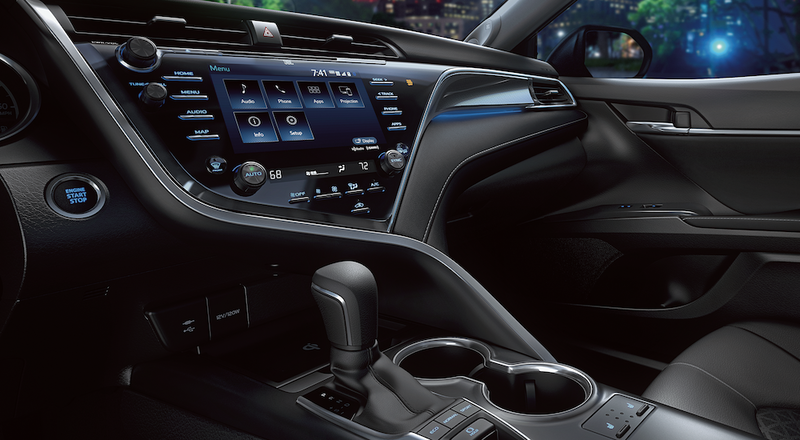 Of course, the 2019 Toyota Camry’s interior includes many additional amenities. The Wi-Fi Connect (powered by Verizon) provides occupants with a strong wireless internet connection. With the ability to connect up to five different devices, you’ll never hear your fellow passengers arguing over access. Meanwhile, drivers will appreciate the 10-inch color Head-Up Display, which showcases essential information right on the windshield. Instead of having to contort your body in order to see your speed and fuel, drivers don’t even have to take their eyes off the road to access this information. The Camry was already considered one of Toyota’s most luxurious rides, and that will once again be the case in the 2019 version. The sleek sedan has a muscular stance, and the smooth lines add a bit of unexpected sportiness. Of course, the front grille (with a sport mesh insert) and the dual exhaust (with quad chrome tips) help to boost that athleticism. 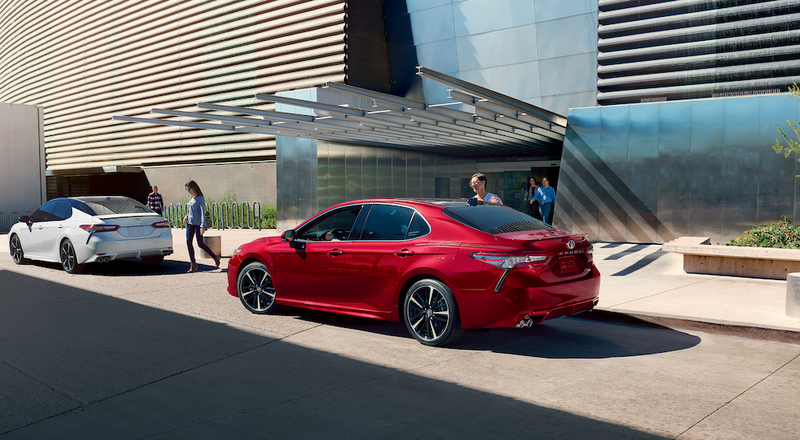 If you’re looking for the utmost style for your new ride, then you’ll appreciate all of the exterior amenities included in the 2019 Camry. If you’re ready to find “Toyota dealers near me“, there’s no better place to purchase your new ride than from Joseph Toyota. In fact, those living in the Cincinnati, Ohio area will only have to make one single stop during their pursuit, as the dealership provides everything these customers could possibly need. For starters, the dealership is fully stocked with a number of new and used vehicles, providing options for customers in any type of financial situation. The Service and Parts department is in place in the event that you run into any issues with your new ride, assuring that you won’t have to turn to a random mechanic. The dealership’s website even includes many intuitive shopping tools, allowing potential buyers to prepare for the experience without even leaving their couch. If you value an easygoing, stress-free buying experience, then you can’t make a better choice than Joseph Toyota of Cincinnati. So what are you waiting for? If the 2019 Toyota Camry is the right car for you, then head out to Joseph Toyota today! Before long, you’ll be zooming off the lot in your brand-new ride.